TUCSON, Ariz., 16 April 2015 – Few places in the continental United States experience nights as dark as those on the Colorado Plateau, but not even the isolation of the Plateau’s wild lands make its skies immune to the harmful effects of light pollution. Protecting the natural nighttime environment in some of America’s greatest national parks and monuments requires educating park staff, visitors and local communities, and adopting good outdoor lighting practices. 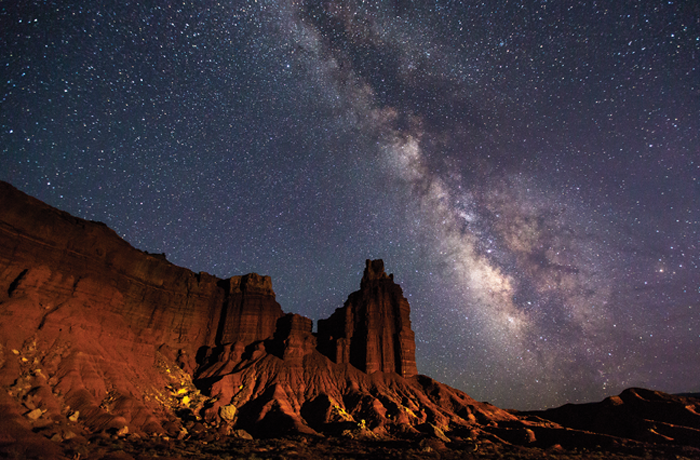 Capitol Reef National Park (CRNP) in Utah has undertaken a multi-year program doing just that and today, the International Dark-Sky Association recognizes CRNP as a Gold-tier International Dark Sky Park. “We are thrilled to honor the excellent work at Capitol Reef National Park that has put it on the map for serious amateur astronomers and casual stargazers alike,” said IDA Executive Director J. Scott Feierabend. Capitol Reef National Park sprawls over 98,000 hectares (242,000 acres) of federal land in southern central Utah. It is named for a visually spectacular region of the Waterpocket Fold, a geological feature that made the area virtually impassable to early Anglo-American settlers. Its domes and cliffs of white Navajo Sandstone, reminding early visitors of the dome of the United States Capitol building, define the Park’s landscapes. Despite serving over 830,000 visitors in 2014, CRNP has largely resisted infrastructure development and instead offers visitors a rustic experience. As a consequence there is very little artificial lighting in the park, so visitors experience a night that is remarkably close to what it would have been in the pioneer era. Today’s announcement is the result of Park efforts over the past decade and a half to raise awareness of its dark skies and help visitors enjoy them. Astronomy-themed visitor programs began in 2000 and expanded considerably during the International Year of Astronomy in 2009. Since 2010 Capitol Reef has partnered with the National Park Service Night Sky Team to host specialized astronomy volunteers called Astro VIPs (Volunteers in Parks) who organize nighttime public programs at the Park. In addition to programs for adults, the Park offers a Junior Night Sky Ranger program to engage kids in learning more about the night sky. Capitol Reef National Park joined with the Utah nonprofit Entrada Institute to present the annual autumn Heritage Starfest star party at the Park beginning in 2013. The two organizations wrote a successful grant to the Outdoor Foundation for funding of the event, allowing them to expand the reach of Starfest into the local community in 2015. The Park leadership believes these efforts are just the beginning in a long-term process to secure the Park’s dark skies for years to come. IDA recognition is only one step along the way to success, but an important gesture in rewarding the hard work already done. “This designation is a testament to the commitment the park has made to preserve its pristine dark skies for this and future generations,” said Superintendent Leah McGinnis.